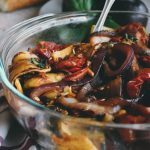 Dress up your outdoor tablescape this season with this layered Summer Eggplant Salad! I wrote recently about how the summer season conjures images of relaxation, backyard parties, or sunset dinner gatherings on the porch. While these ideas are lovely, to truly make them memorable you might want to do something unexpected, or serve something ‘outside the box,’ or just ‘glam it up’ a bit, but of course that raises the question of where to start. 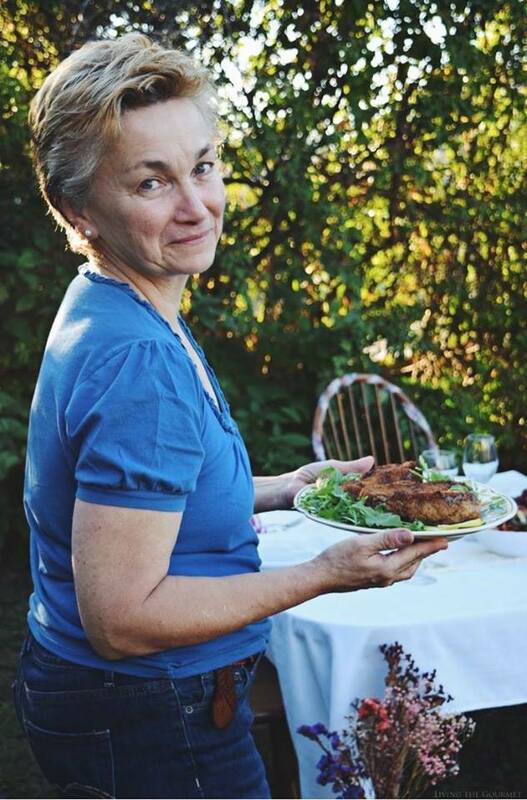 Back to the metaphor of the puzzle, what is among the first things you serve at a warm summer party, whether for dinner on the porch or outside in the sun – the salad. That’s the first piece of any such get together, and is often times the first things your guests will taste alongside your starters. Now, while giant fruit bowls or grilled fruit serve excellently, and can certainly glammed up on their own, I’m thinking of taking things in a slightly different direction to enhance both the ‘summery’ flavors and textures – while keeping all of the ease and yet enhancing the elegance several fold. 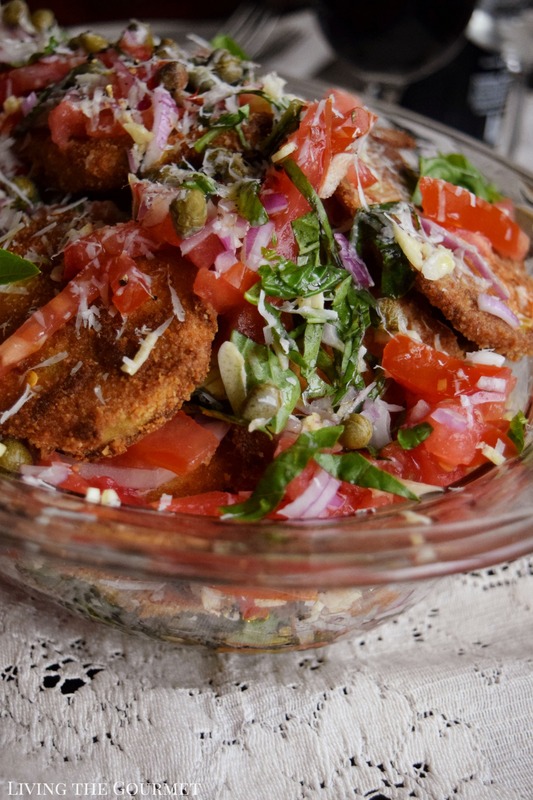 That, of course, brings us to today’s recipe – Mediterranean Style Eggplant Salad. 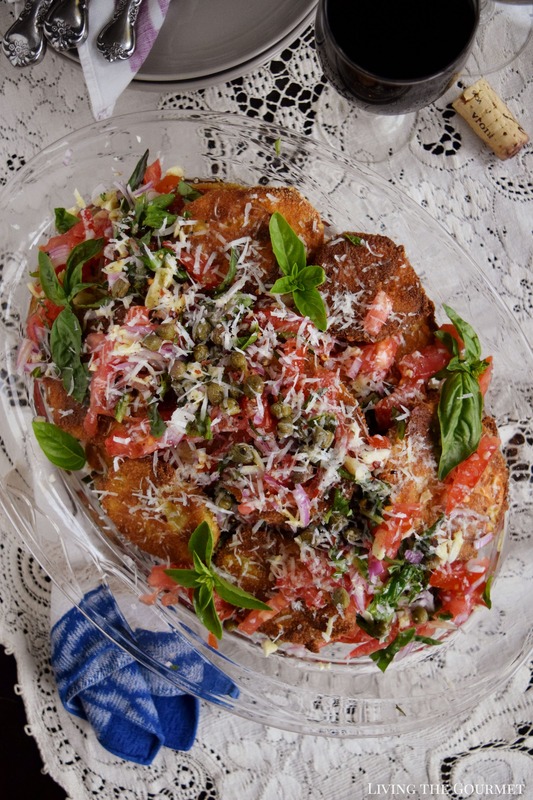 This is a dish that my first generation Sicilian mother used to make all the time during the warmer weather, and in several distinct variations. The variation today is a sort of combination of everything that I can remember from what my mother made, a sort of combination of all the best parts – though I’ll provide some variation tips below. First and foremost, from the fresh tomato and basil drenched in olive oil, to the combination of capers and red onion, this dish simply screams “Warm weather by the Sea,” since if you can combine this with salty sea air, there really are few things better for a warm weather dinner party or late afternoon gathering, trust me on that. To start things, we begin by preparing the eggplant – which we peel as thoroughly as we can, but be careful not to damage the eggplant since we want the slices whole and sturdy. Once the eggplants are peeled, slice them to about a quarter of an inch in thickness. You can go slightly thicker, but I would not go thinner since that will result in them getting soggy once combined with the salad. From there, dredge the slices first in flour, then in an egg wash, and then in seasoned bread crumbs as shown below. Then set them either on a set of nonstick baking sheets or with a drizzle of olive oil over the top of each prepared eggplant slice, and bake for about fifteen to twenty minutes until they are nice and golden, turning them once during the process. Then let them cool while we prep the salad portion of the recipe. On a side note, if you prefer your eggplant slices grilled as opposed to breaded, that would serve excellently as well. Simply oil up a griddle with olive oil, and grill them until they have beautiful char lines, and then, similarly, set them aside to cool as we prep the salad. This variation would probably serve better alongside barbecued food as it would both provide a lighter contrast to your grilled meat while keeping the grilling theme consistent. As to the salad portion, we begin by drizzling the bottom of a bowl with olive oil and set down a layer of the prepped eggplant slices, and then top that with sliced tomatoes, fresh basil leaves, sliced onion, dried oregano, a generous dash of red pepper flakes, a few dashes of freshly ground black pepper, capers and capers juice, and a generous dusting of grated cheese, your choice of Romano, Asiago, or Parmesan. For a hardier variation, you can also substitute or simply add mozzarella slices, and stack those slices over the tomatoes with a dusting of fresh Italian parsley followed by the rest of the ingredients mentioned above. 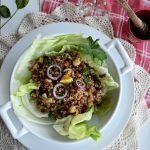 Use your imagination and your won taste as you would with a ‘regular’ salad, this is an eminently versatile recipe. Repeat that layering process until you have filled the bowl, and then refrigerate until you’re ready to serve it. 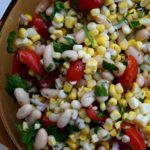 Keep in mind, that you can make this salad well ahead, since it marinates as it sits, meaning over the course of a day or two in the fridge this salad will only get better. Set up three shallow bowls; one with the flour, one with the egg wash and one with the bread crumbs. Dredge the eggplant slices first in the flour, then in the egg wash and finally in the bread crumbs. Place in the oven and bake for 15 – 18 minutes, or until they turn a nice golden, turning once. Drizzle the bottom of a bowl with olive oil and place a layer of eggplant slices over the oil. Repeat this process until the eggplant is used. Refrigerate until ready to serve. Serve with a delicious crusty bread to dip in the oil of this salad. This dish gets better the longer it sits in the refrigerator. And just like that, you’ve put together the first piece of your Summer Dinner Party Menu. Over the next week or two, we’ll putting together the other pieces for you as well. Stay tuned for our Ultimate Charcuterie Board with Individual Pizzas for an awesome pairing. Wow, that looks gooooood!!!! When’s dinner? I just plucked a pair of eggplant from my garden last night and was hoping to find some new way to serve them. Well, I just think that I found it. Thank you so much! I have a friend that loves eggplant. That looks like a dish she would enjoy, it sounds rather hearty. Ok, that's a fantastic way to eat eggplant. 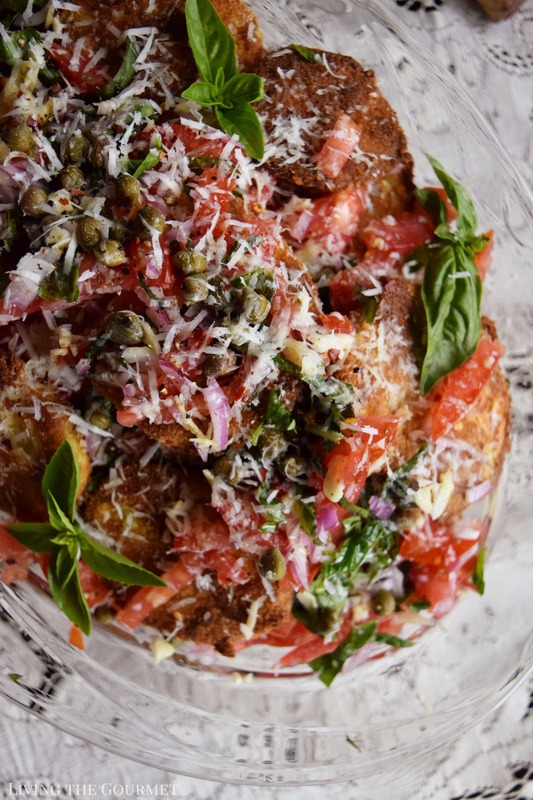 I love egg plant, but don't make it that often because I usually only do eggplant parm. My family will love this! Eggplants are so fabulous really like them a lot! Nice that we have them available during summertime. 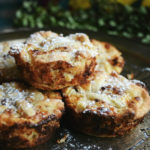 Super tasty recipe that you are suggesting, yummy! I love breaded eggplant slices and often use them in my sandwiches and salads. This salad sound very much like one I would enjoy! Perfect for this summer weather. Yum. I no sooner so your title and the photo I immediately pinned it to make later. The salad is a precursor of what is to come -- so make it fantastic!! I've never made an eggplant salad but I can guarantee I will in the near future. Love this!! 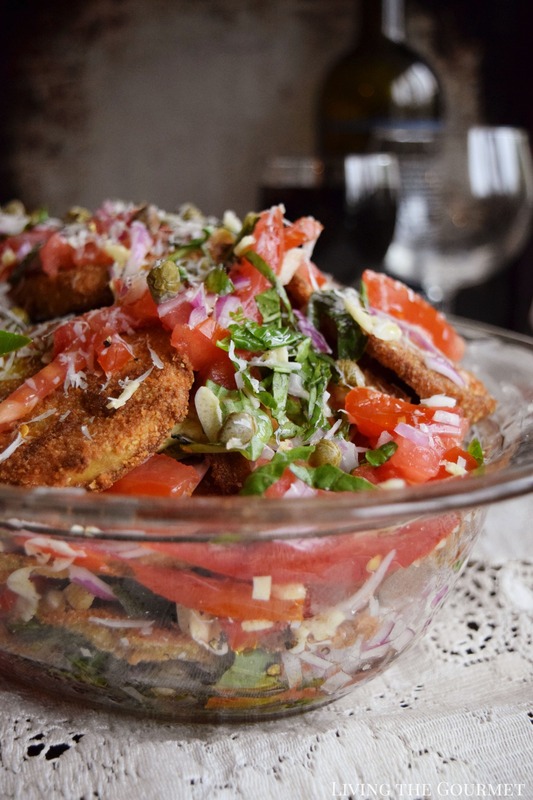 Such a beautiful salad and the perfect flavor combinations .. love that you added eggplant .. I haven't seen a salad with it before and adding it to yours is genius!!! Oh goodness, I love eggplant parm or just breaded and pan fried. I'm excited to try a new recipe so I can enjoy one of my favorite veggies. Piecing together a puzzle. Love that, and I love how you breaded the eggplant, never thought of that before. Most salads need to be dressed and served straight away. 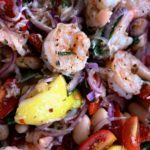 So I really like how you made a salad that marinated and only gets better over time! Outstanding combination of flavors ! I love the whole idea of eating eggplants on salads , delicious! I don't believe i have ever tried eggplant salad, but very interested in trying it. Thanks for sharing the recipe!